Blu Navy - View timetables, Compare and book ferry tickets at directferries.ie. 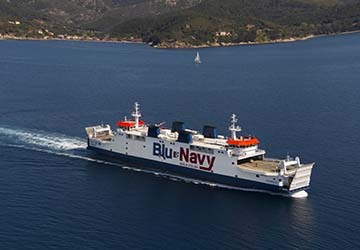 BN di Navigazione, or Blu Navy, is an Italian ferry operator connecting the towns of Piombino in Tuscany and Portoferraio on the island of Elba, while the subsidiary group BN Sar Nav offers routes between Corsica and Sardinia in the Mediterranean Sea. Originally offering just six daily departures when the company was founded in 2010, Blu Navy has steadily grown into an established brand in the Italian shipping industry, boasting an extensive timetable and a superb punctuality record. Blu Navy currently uses a large vessel called ‘Acciarello’ which has a capacity of 800 passengers and 200 vehicles, with the capability of loading and unloading in just thirty minutes. Measuring a hundred and thirteen metres long and eighteen metres wide, and with a cruising speed of sixteen knots, Acciarello is one of the most efficient passenger ferries in the Tyrrhenian Sea. The ferry underwent a complete makeover in 2015, with the focus on improving the comfort and entertainment on board. It now has luxurious seating areas and a top-quality bar serving delicious snacks and refreshments, as well as a newly designed garage, allowing customers to park their vehicles with ease. Directferries.ie allows you to compare Blu Navy timetables and fares with all alternative ferry operators before deciding on the best option for your trip.